Nduke is an Oceanic language of the southwest Pacific spoken by the c.3000 indigenous inhabitants of Kolombangara Island, in the Western Province of Solomon Islands. Kolombangara is a spectacular high extinct volcanic island about 30km in diameter. At the time of anthropological study of Nduke by A.M. Hocart in 1908, Nduke speakers numbered about 250. It is likely that numbers had been higher prior to about 1850, but headhunting had wiped out the island's people except in rugged mountainous country in the island's southwest, an area at that time known as Nduke by the people on neighbouring islands. The remains of villages and fortified hilltops dating from the nineteenth century are still to be seen in the highest areas of the island's southwest ranges. Nduke people at that time were in alliance with powerful warlike groups on nearby islands, and, as with those neighbours, conducted headhunting raids by war canoe on more distant islands. During the nineteenth century, Nduke was an agricultural exporter in the local inter-island economy, trading taro and processed Canarium nuts in exchange for goods from other islands. The remains of extensive irrigated taro fields are still to be seen, and the extensive nut groves are still used. From the 1870s onwards, Nduke people began to trade copra to European traders. This trade was interrupted in 1880 when Nduke warriors slaughtered the crew of a copra-trading schooner and earned the island a fearsome reputation among the traders. Headhunting was almost fully suppressed by the British Protectorate government by 1900, enabling settlements to safely move from the mountains to the coast. The Methodist Mission established a church in Nduke in 1915, and the Seventh-day Adventist Mission established their first church in Nduke in 1919. By the late 1920s, almost the population had converted to Christianity and had resettled in five coastal mission villages: Hambere, Vavanga, Ghatere, Hunda and Kuzi, all of which were SDA except for Hunda, which was Methodist. Throughout the mid 20th century the economy was based on subsistence crop production and copra cash cropping. After the Second World War, which had directly affected Kolombangara with heavy fighting in 1943, development gradually gathered pace, with better medical treatment beginning in the 1950s leading to a rapid population increase. The expanding population began to spread around the coast of the island. New patterns of intermarriage with eastern Solomons and subsequent mixed households began an accelerating trend from the 1980s for Pijin to compete with vernacular Nduke as a household language. After national independence in 1978, educational and work opportunities increased, and status within Nduke society became increasingly associated with educational attainment and professional occupations. By the 2000s a strong professional cohort had emerged, with many Nduke speakers now working in the capital city, Honiara. 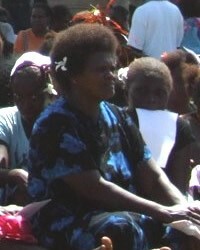 Nduke is now a relatively affluent group within Solomon Islands. With increasing money supply, many families have replaced vernacular houses with larger, permanent, iron-roofed houses. Relative wealth differences are growing between families within the villages. Basic village infrastructure including water supply, sanitation, electricity, transport and telecommunications is still not well developed. Social cohesion is challenged by growing village sizes, nucleation of family resources and breakdown of traditional community authority. Pressure is growing on agricultural land. Widespread and ongoing logging of the forests since the 1990s has not seen a corresponding social dividend. While Nduke language remains widely spoken, its lexical content is becoming increasingly depleted among the younger generations and Pijin continues to make inroads as a primary household language. View Duke in all countries. 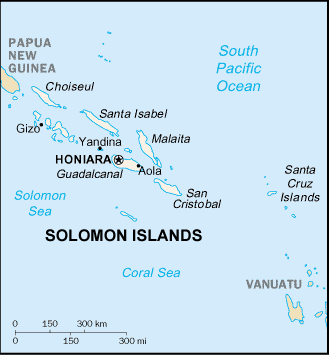 Location in Country: Western province: Kolombangara island.